Measuring Transport Equity provides a methodology with the potential to shape the transportation decision-making processes, thus allowing for the adoption of more equitable transport solutions. 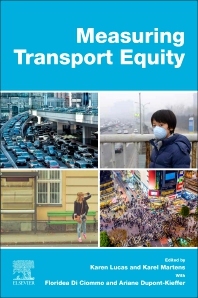 Focusing on numerous applied methodological approaches to transport equity assessment, the book formalizes the disciplinary practice, definitions and methodologies for transport equity. In addition, it recognizes the different types of equity and acknowledges that each requires their own assessment methodologies. Bringing together the most up-to-date perspectives and practical approaches for assessing transportation accessibility, environmental impacts, health and wellbeing, the book sets standards for researchers, policymakers and practitioners for conducting social impact analyses. 12. Safety and daily mobilities of urban women: methodology to confront the policy of "invisibility"
Karen Lucas is Professor of Transport and Social Analysis at the Institute for Transport Studies at the University of Leeds (UK). She has been a social researcher of transport for 20 years with a specialist interest in the interactions between transport poverty and social deprivation. She is considered a world leader for her contribution to research into the role of transport and social exclusion and has published extensively on this topic. Karel Martens is Associate Professor of Transport Planning at the Faculty of Architecture and Town Planning at the Technion - Israel Institute of Technology (Haifa, Israel) and at the Institute for Management Research at Radboud University (Nijmegen, the Netherlands). He has published extensively on the nexus between transport and justice, culminating in his recent book Transport Justice: Designing Fair Transport Systems. Floridea Di Ciommo is a lead researcher at the Centre for Innovation in Transport (CENIT) based within Barcelona Tech, where she is responsible for the research area on Sustainable Mobility and Travel Behaviour. She is chair of Transport and Equity Analysis TEA Cost Action TU1209 and a member of two TRB Committees. Ariane Dupont-Kieffer is based at the University of Paris 1 Pantheon-Sorbonne. From 2005-2014, she was employed by IFSSTAR where she worked to build an understanding of the links between economic theory, modeling, policymaking and policy assessment in transport. Her current focus is more specifically on the history of economics and macroeconomics, and the relationship between measurement issues, statistical analysis and policymaking. She is a leader of the Women’s Issue in Transportation Committee of the TRB.